The Squat is the ultimate lift for building lower-body strength and power. The alternatives? Pure garbage. Not worth a second of your time. If you’re not going to Squat, you might as well hack off your legs and throw them in a dumpster. OK, that’s way over the top, but the sentiment might sound familiar. The Squat is the best lower-body exercise, and it should have a place in every athlete’s program. However, not everyone can Squat all the time. Injuries, nagging soreness, scarcity of equipment and other issues can prevent all kinds of people from performing standard barbell Squats. Does that mean people should forget about training their legs? Of course not. One exercise that catches a ton of flack is the Leg Press. Whenever it is discussed, someone inevitably interrupts to say squatting is better. But although this may be true in many cases, the Leg Press is far from worthless. Here’s why this oft-maligned exercise can be a valuable part of an athlete’s training regimen. You’d be hard-pressed to walk into a gym that doesn’t have a Leg Press machine. It is one of the most popular pieces of equipment among fitness enthusiasts. Although the Squat rack deserves the same respect, the reality is that some gyms don’t have them. They’re big, they’re expensive and they take up a lot of room. I know that Planet Fitness, one of the biggest commercial gym chains in the country, doesn’t have Squat racks. Should they? Ideally, yes. But sometimes you have to make do with what you’ve got. While slight differences exist among Leg Press machines (including incline level and loading methods), most of them look fairly similar to that design. The most common criticism of the Leg Press is that it doesn’t build “functional strength.” Functional strength refers to the strength needed to perform movements people make in everyday life. Functional strength is tremendously important for athletes, because it serves as the basis of athletic movement. To critics, the Leg Press is worthless because no one—athletes or non-athletes—ever encounters a situation in which they are lying in a chair and use their feet to push a load away from them. Free-weight exercises generally do build functional strength—and enhance athletic attributes like balance and stability—more effectively than machine-based exercises. Exercises like Squats, where you control your own body weight (plus a load) in space with nothing to rely on for support, are the best for increasing athletic performance. Think of it like this: with a machine, the load you move is locked in place; it cannot wiggle, it cannot fight, it cannot get away. In contrast, the stabilization and variable range of motion needed when you use free weights enhances your dynamic abilities as an athlete. Another common criticism of the Leg Press is that it can put heavy pressure on the lower back. It is also frequently derided as a “show-off machine,” because poor form can allow people to press greater amounts of weight than their bodies are ready to handle. This can be dangerous. Although the Squat does build functional strength better than the Leg Press, the idea that the Leg Press builds absolutely no functional strength is flawed. Several studies have proven that regularly training with a Leg Press machine results in improved functional strength. Since the Leg Press is an easy, accessible exercise (much more so than the barbell Squat), many of these studies have centered around helping elderly people or those recovering from injury or disease. A 2009 study found that those recovering from heart disease benefited from an 8-week training program of Leg Press exercises. Their workouts consisted of 4 sets of 4 reps of Leg Press at 85 percent of their max, with 2 minutes of rest between sets. The participants performed the workouts three times a week. By the end, their one-rep max had increased 44 percent and their walking efficiency improved by 35 percent. A different study, using a similar program (a treadmill test to exhaustion), found the performance of people with peripheral arterial disease improved by 14 percent after they worked out on the Leg Press. A 2014 study found that a six-week, machine-based, lower-body resistance-training program had a significant impact on elderly people’s single-leg balance. The workouts (which included Leg Presses) helped improve their performance in a balance recovery task by 30 percent. A 2012 study found that elderly woman benefited from a 12-week program that included Leg Press, knee extension and knee flexion exercises. By the end of 12 weeks, participants improved their vertical jump by 3 to 4 inches and could perform more bodyweight Squats in a 30-second period. “Leg press training improves balance recovery, vertical jump height, number of bodyweight Squats in 30 seconds and short-distance sprinting ability,” wrote Chris Beardsley, managing director of strength and conditioning research, in a 2014 blog post. If you’re thinking that the Leg Press only improves functional strength in the sick and the elderly, there are other studies that show similar results in young people. A 1996 study of college-aged participants found that a six-week Leg Press training program resulted in a 2.55-inch increase in single-leg jump height. Would the increases in functional strength have been greater with a barbell Squat training program? Probably. But to say the Leg Press is totally useless is just flat out false. The Leg Press should not be your main lower-body strength exercise, but it’s perfectly fine to include it in your routine every now and then. As long as you’re also doing other, more functional lower-body exercises, it can contribute to your overall progress. However, the best way to use the Leg Press machine is one leg at a time. 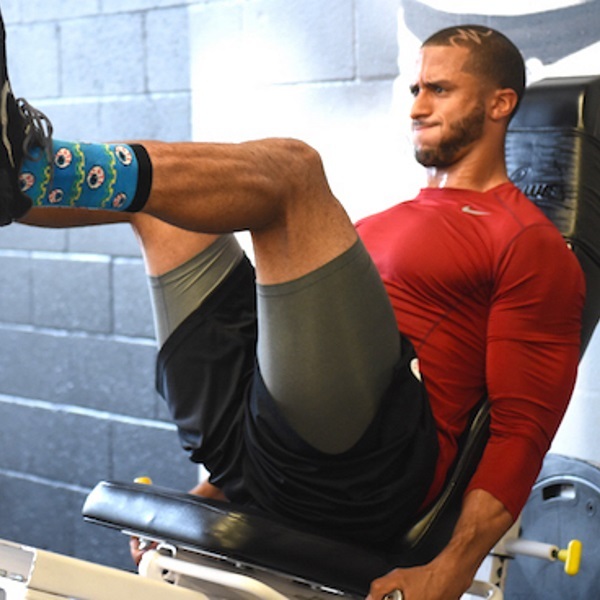 The Single-Leg Press exercise is performed by elite athletes like Colin Kaepernick and Dwyane Wade. It is a more functional variation, since almost all athletic movements are done from a single-leg position. “I like single-leg work because it isn’t often as a quarterback that both of your feet are stationary and planted,” Kaepernick told STACK. The Single-Leg Press also addresses two other common criticisms of the Leg Press. It forces you to use less weight and have greater control over the weight, which makes the exercise safer. And it ensures you’re symmetrically building your lower body instead of letting one side handle most of the work. The Single-Leg Press is fairly easy to perform as long as you keep a couple of key form cues in mind. To increase its effectiveness, you can experiment with the tempo of the exercise, as Quintin Mikell does here. Place one foot in the center of the footplate with your toes pointed slightly out. Drive the weight away from you in a controlled manner. Drive with your entire foot, not just your toes. Don’t lock out your knee at the top of the movement. Keep your core engaged throughout the movement; think of “sucking” your belly button against the bench/seat. Slowly lower the weight back to the starting position and repeat. Focus on full range of motion more than on using heavy weight.